Using the finest ingredients in the world makes it easy to produce amazing dishes and often the simpler the dishes are, the easier it is to appreciate their quality. First up, the toasted sandwich. Take some excellent Irish Ham and Irish Cheese with some good crusty bread and it’s rendered even more delicious when the cheese is melted. 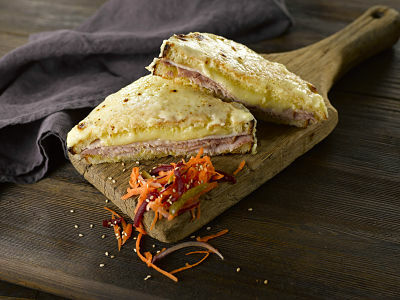 You could go a few steps further and make the posher ‘croque monsieur’ version below if you really want to impress. This is a sophisticated toasted ham sandwich- very popular in France. The cheesy topping is what makes this sandwich extra tasty. Served alongside a carrot and beetroot salad this dish is ideal for a casual lunch. Preheat the grill to medium-high. Line the grill tray with foil. Put the butter in a saucepan over a medium-low heat to melt it. Brush one side of each slice of bread liberally with melted butter and put under the grill butter-side uppermost until golden and crisp, then set aside. Stir the flour into the remaining butter to make a paste, cook for a minute, then gradually whisk in the milk, a little at a time, until smooth. Simmer for a few minutes, until thickened, then take off the heat and stir in 60g cheese until melted. Grate in a little nutmeg, stir and season lightly. Spread the untoasted sides of four slices of bread with mustard, then put the ham on top, followed by the cheese, and pop under the grill for a couple of minutes until the cheese has melted. Top with the rest of the bread, with the toasted side uppermost, and push down, then put the sandwiches on to the grill tray and spoon on the bechamel sauce. Grill for about 5 minutes, until golden and bubbling. Serve immediately with the salad. To make the salad: combine the carrot, beetroot, gherkins, onion and radishes in a bowl. In a separate bowl whisk together to olive oil, lemon juice and season with salt and black pepper. Stir this through the vegetables. Sprinkle over the toasted sesame seeds. Place the ham in a large saucepan and cover with cold water. Add a few peppercorns and a bay leaf. Cover with a lid and bring to the boil. Then reduce the heat and simmer gently for 20 minutes per half kg. Heat oven to Gas Mark 6, 200˚C (400˚F). Melt the butter in a frying pan over a medium heat and add the onions. Cook gently until softened and lightly coloured. This will take about five minutes. Add in the thyme. Lightly butter a 1.5 litre gratin dish. Add the potatoes and onions to the dish in layers. Season as you go and finish with a layer of potatoes. Pour the warm stock over the potatoes. Top with a lightly buttered layer of greaseproof paper. Bake for 50-60 minutes until the potatoes are cooked and the top is golden and crisp. To make the Glaze: Using a potato peeler thinly pare the peel off the orange. Then chop the orange into chunks, cutting away any pith. Place the orange peel, orange chunks, redcurrant jelly, mustard, shallot/onion and ginger in a food processor and blend until smooth. To glaze the ham: When the ham is cooked take it from the saucepan and place it in a roasting tin which has been lined with greaseproof paper. Keep the cooking liquor to add to soups and sauces. Allow the ham to cool a little then score the fat and brush about a quarter of the glaze over it. Set aside the rest of the glaze to serve as a sauce with the ham. This can be served cold. Bake the ham in the oven for half an hour until the glaze is golden and bubbling. Remove from the oven and allow to rest for 15 minutes. 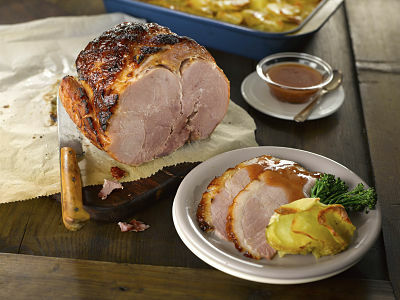 Slice the ham and serve with the Boulangère Potatoes, the remaining glaze and tender stem broccoli. Pre-heat your oven to 190C/170C fan/Gas Mark 5. 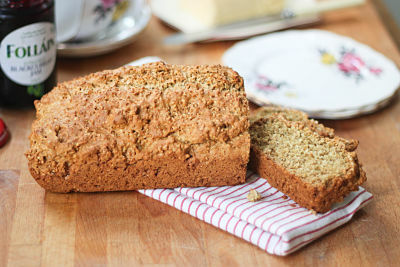 Combine 225g of Macroom Coarse Brown Flour with a tsp of bread soda, a tsp of salt, and 225g of plain flour sieved. Add a tsp of dark brown sugar and mix well. Mix 2 tbs of sunflower oil with 235 ml of buttermilk, and add to the flour, mixing lightly with your hands until the mixture is sticky. Transfer the mixture into a greased loaf tin, score it, and bake for 45 minutes until the bread is golden. Allow the bread to cool in the tin for 10 minutes before transferring to a wire rack to allow to cool before slicing. 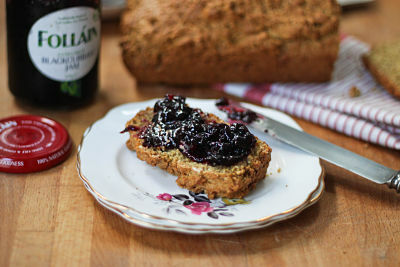 And if you’re looking for something to top it with you won’t go wrong with one of Folláin’s delicious jams & preserves slathered on top.